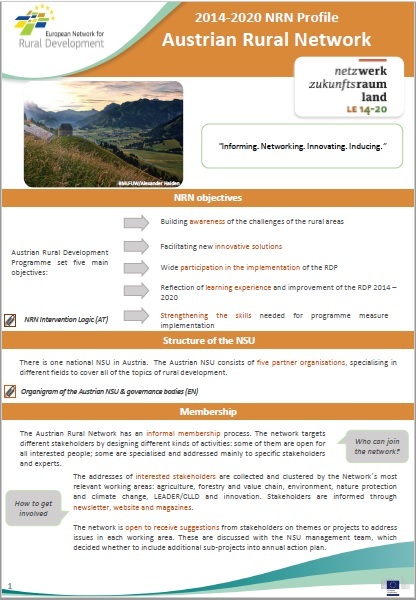 National Rural Networks (NRNs) operate in each EU Member State to support and enhance rural development objectives as defined in the Rural Development Programmes (RDPs). NRNs enable and facilitate exchange and learning between all the partners involved in Rural Development policy implementation: public authorities, economic and social partners, and the relevant bodies representing civil society. See below profile documents providing key information on the structure and functioning of the networks and their Network Support Units (NSUs). The NRN profiles include sections on the main NRN objectives, membership, governance, budget, and communication and self-assessment activities. Network Self-Assessment: overview and useful resources on NRN self-assessment approaches and activities. The profiles of the 2007-2013 NRNs can be accessed through the archived ENRD website.